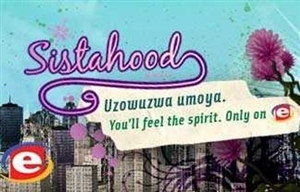 Sistahood is a South African youth talk show which forms part of e.tv's Craz-e programming block, which is targeted at a teen female audience. The show describes itself as "for girls, by girls - an exclusive platform for female expression". The series premiered on e.tv in 2006. It airs every Monday at 15h30, with repeats on Saturdays at 09h35. Episodes are a half-hour in length. Sistahood is the first of its kind for youth television programming in South Africa. For girls, by girls - an exclusive platform for female expression. For too long, society's obsessions with flawless beauty and superficialities have undermined the positive self-image of young women. Sistahood, whose ideals are about keeping it real, resists these stereotypes and prefers to look deeper into the make-up of young women in order to empower them on their own terms. Sistahood's contemporary and energetic platform occupies the girl-to-girl chat format and embeds it with relevant topics about boys, make-up, fashion, music and girl-power guests with the intention of uplifting, empowering and inspiring young women. Part of the thinking behind the show is a commitment to showcasing the ways in which women distinguish themselves in so many spheres of public life. Building role models is key to the genuine inspiration of young people, and weekly girl-power guests allow viewers to identify with and aspire towards embodying sound values and motivations. Sistahood's inspiration comes from the following quote made by Elizabeth Blackwell, the first woman in the USA to become a physician: "For what is done or learned by one class of woman becomes, by virtue of their common womanhood, the property of all women." Sistahood's stated mission is to "fulfil the need, to inspire, to uplift, to empower, to showcase and to keep it real and original in order to make every Sista comfortable in her own skin." Sistahood's personality is one that seeks to explore, to unravel and to unpack the many layers of issues concerning girls today, in a fresh and entertaining way. Each week the main presenter chills with two or three other Craz-e female presenters in an exclusive and very trendy clothing shop. In every episode a Girl Power guest is invited to "shop" and talk about being on the move and going places. The show is unscripted - all the dialogue is ad-lib.